Citizens for Conservation, one of the oldest and most successful volunteer conservation groups in Illinois, recently announced that it has acquired two parcels of land that are significant additions toward achieving the group’s 25-year strategic goal of linked ecosystems in the Barrington area. One parcel was acquired from Arthur Rice III and Lynn Rice and is across Hart Road to the west of Citizens for Conservation’s Craftsbury Preserve, which is currently being restored. 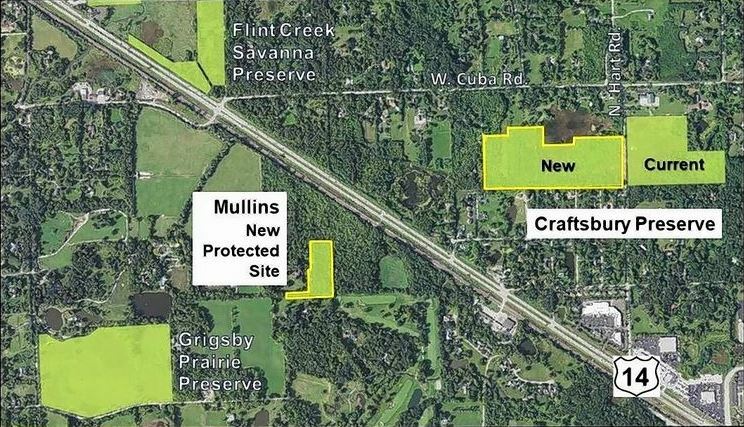 Citizens for Conservation plans to consolidate the preserve with the new, 31-acre parcel, creating a single preserve The new preserve will be 53 acres and will be Citizens for Conservation’s second-largest preserve after Flint Creek Savanna. 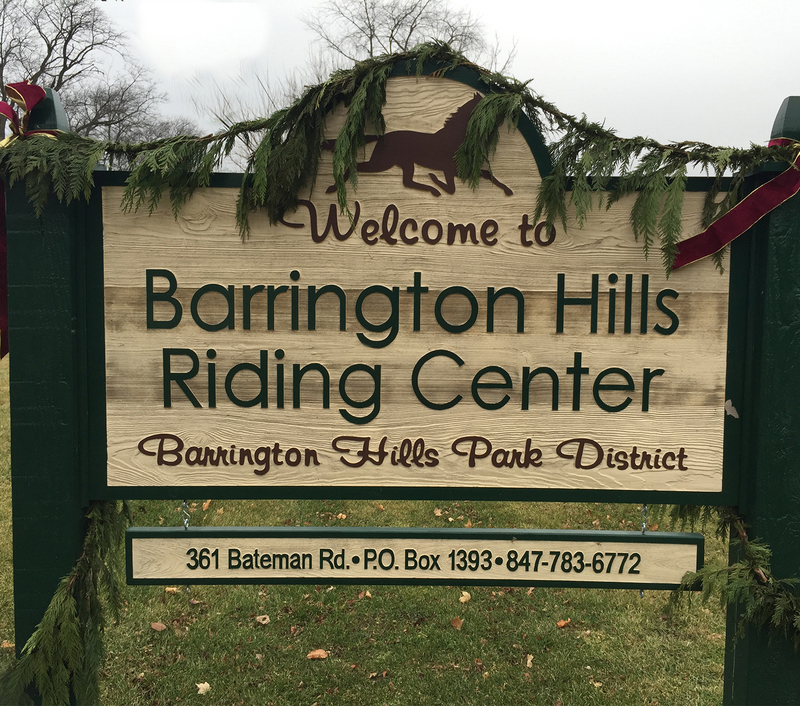 The other parcel of nearly five acres on West Oak Knoll Road in Barrington Hills was donated to Citizens for Conservation by the Joan Y. Mullins Trust. 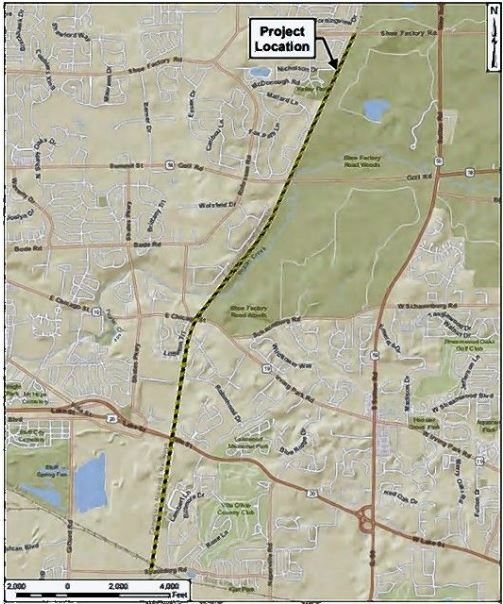 The land is near Citizens for Conservation’s Grigsby Prairie Preserve and is adjacent to the open space of Barrington Hills Country Club. 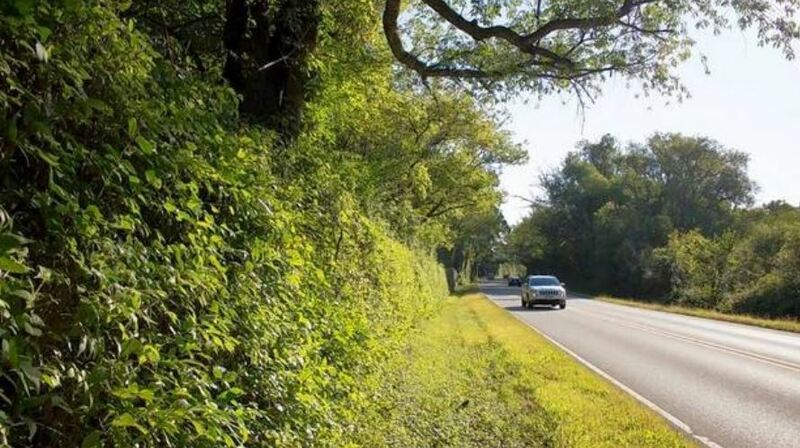 Citizens for Conservation will be developing land management plans for the property in the future. The acquisitions are important to Citizens for Conservation for a number of reasons, said Kevin Scheiwiller, Citizens for Conservation’s restoration manager. “The new Craftsbury tract of land offers rolling topography and wetland depressions left over as the last glaciers receded from this area,” he said. 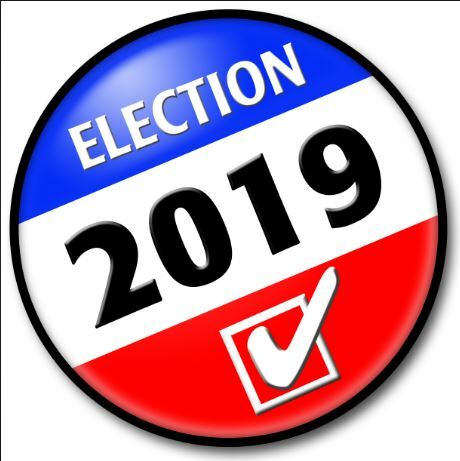 Four candidates are running for three 4-year terms on the Barrington Hills Park Board: Board President Dennis Kelly, Board Treasurer Gigi Iacovelli, Board Vice President Steve Allen and Deputy Village Clerk Robin Van Castle. 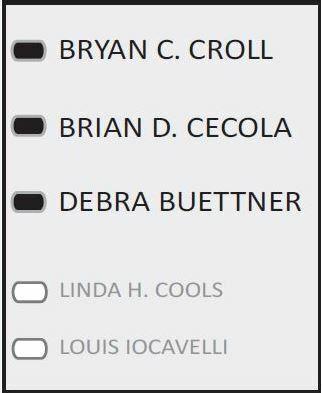 Kelly and Iacovelli have returned candidate bios and questionnaires for the public to review. The other two have not. 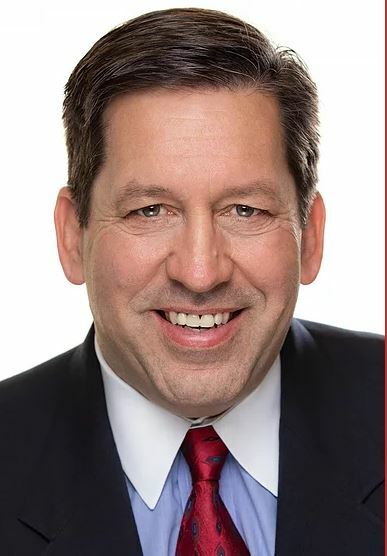 We endorse Kelly and Iacovelli. 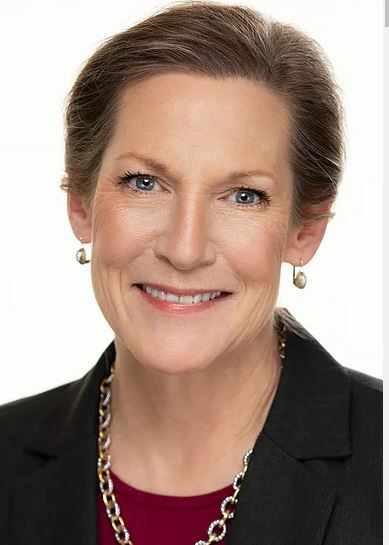 To read the Daily Herald endorsement, click here. .
Four of five candidates vying for three seats on our Board of Trustees along with at least two-dozen residents attended the recent League of Women Voters (LWV) candidate forum held at the Barrington Area Library. The LWV has released a video of the hour-long forum that can be viewed here. 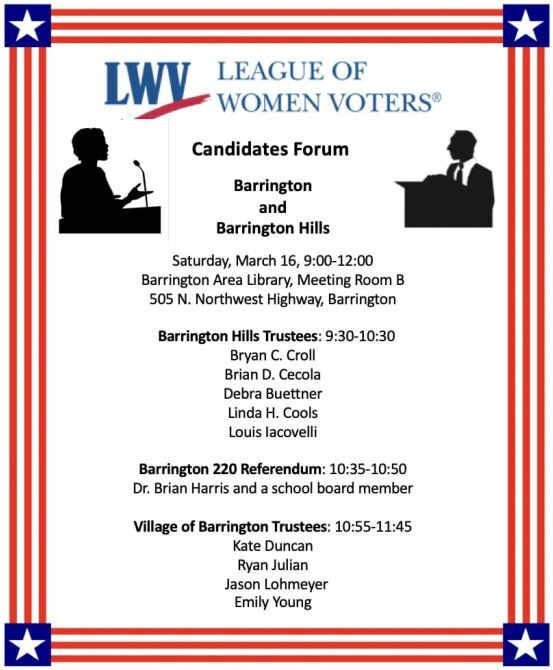 The LWV has also released a video of Barrington District 220 pitch for the $185 million referendum to be voted on by residents on the April 2 ballot. A recording of that video can be viewed here.